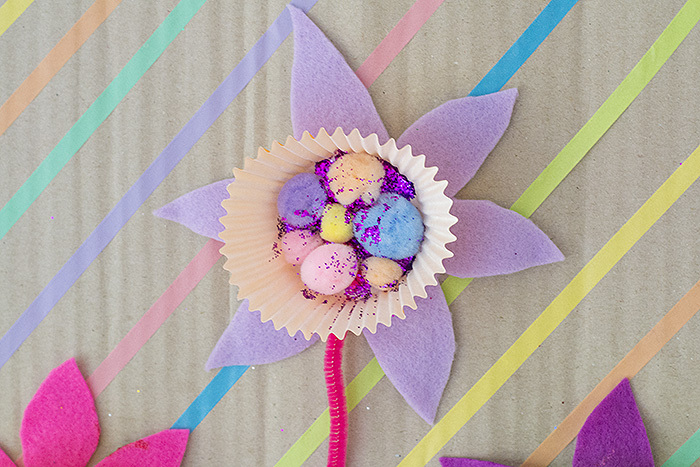 This month’s craft pack for my Bostik Blogger’s challenge was fab and we had so many ideas we didn’t know what to make first but eventually decided to use the cup cases, felt, pom poms and pipe cleaners to make flower art. I started by pushing the bendy wire through the cake case and bending it to hold it in place. Then we poured rather a lot of glue inside and stuck the pom poms down. This was followed by pouring more glue on top and covering them in glitter, Cherry is three and EVERYTHING has to be covered in glitter. I then cut a flower shape out of the felt and stuck the cup case on it. Next I used some of the corrugated cardboard that I’ve had lying around for ages to make the background. I cut out a square and stuck strips of washi tape across it. I got mine from Tigerlilly Quinn’s Shop. Before sticking the finished flowers on the cardboard. It’s now on the wall in our kitchen!